A Scottish National Party (SNP) MP is calling for a debate into the controversy surrounding a disease she thinks will be one of the “biggest medical scandals of the 21st century”. 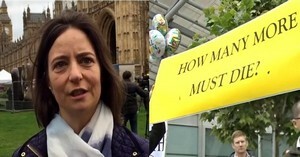 Glasgow North West MP Carol Monaghan has launched an early day motion in parliament on myalgic encephalomyelitis/chronic fatigue syndrome, commonly referred to as ME/CFS. An early day motion (EDM) is a request from an MP for a debate to be held. While the debates don’t always happen, the motions are good for gauging the levels of support among MPs for an issue. They also raise awareness of the particular topic the motion refers to. "That this House recognises Myalgic Encephalomyelitis (ME) Awareness Week from 7 to 13 May 2018, which aims to highlight the impact this invisible illness has on 250,000 people across the UK; recognises the fantastic work campaigners and charities are doing to highlight ME as a physical condition which is not all in the mind; acknowledges the detrimental effect of the PACE trials and its results, and the work which is being done to reverse this; and encourages people to go blue for ME across the week, to further bring this illness out of the shadows and into the spotlight." For the thousands of people living with ME/CFS in the UK, a parliamentary debate can’t come soon enough.